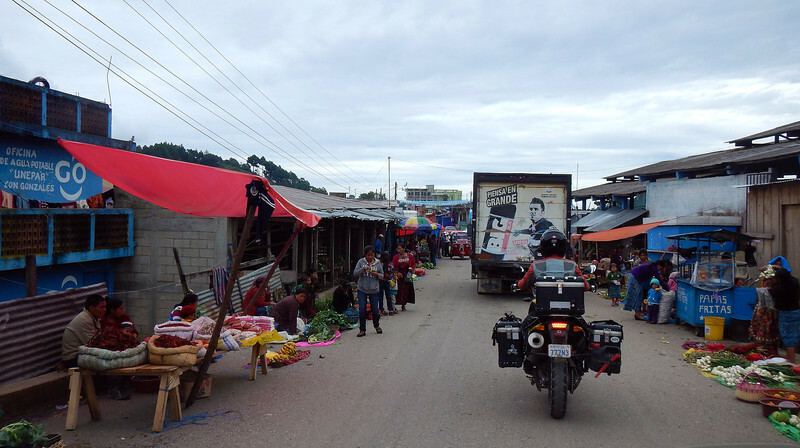 After a restful two days at Mil Amores, we are ready to hit the road once again, heading south through the Guatemalan Highlands, rolling through the smooth pavement switching back up and down the mountains. Along the way we pass small towns and even smaller villages. We tiptoe on the dirt shoulder, past a lineup of stopped chicken buses. Passengers are grabbing their belongings off the buses and abandoning them, walking further ahead. There is lots of confusion at the roadblock, drivers and pedestrians give us conflicting information: "You can't pass, turn back! ", "Take this stony road that goes into the jungle to get to the other side" and "You want to buy a chicken?" WTF? 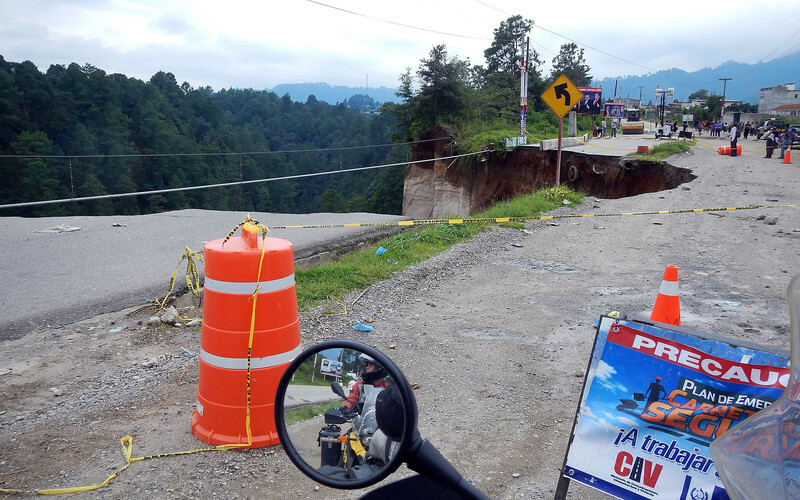 When we get past the front, we see the road has fallen away into the valley below. Oops. In the end, we followed another biker as he pushed his way past people on the sidewalk. 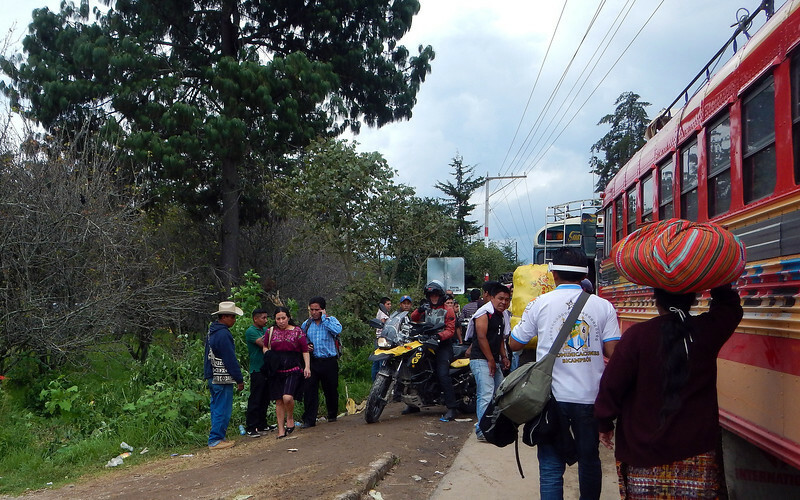 That turned out to be the correct call and we're back on the road again, leaving the stranded trucks and chicken buses fuming impatiently on the other side! 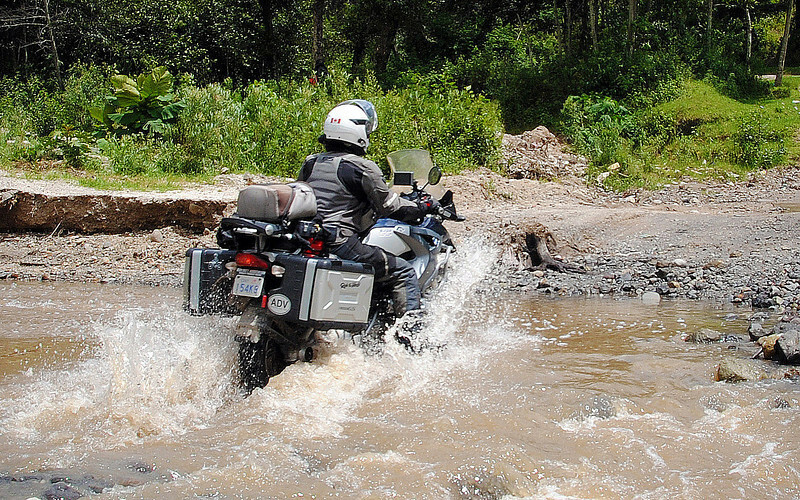 Ah, the pitfalls (literally) of riding through the Guatemalan winter. My bike is not doing well with the regular gas I am feeding her. Lots of engine pinging in the low revs while climbing up the hills in the past few days, and I have to keep the revs high in order to keep her from complaining too loudly. As we near our destination of Panajachel, I treat her to some premium drink. I glance at the bill and shake my head - she's dining a lot better than I am. Perhaps she goes back on a diet when we reach flatter terrain. Her and I, both! We checked into the same hostel that we stayed in the first time, the one with the parrot security guard. I had a little conversation with our feathered friend. I've provided some subtitles. Bloody bird speaks more Spanish than I do. FML. It's very interesting walking around Pana almost 6 months since the last time we visited. We are really getting to see this place and the country in two different seasons. 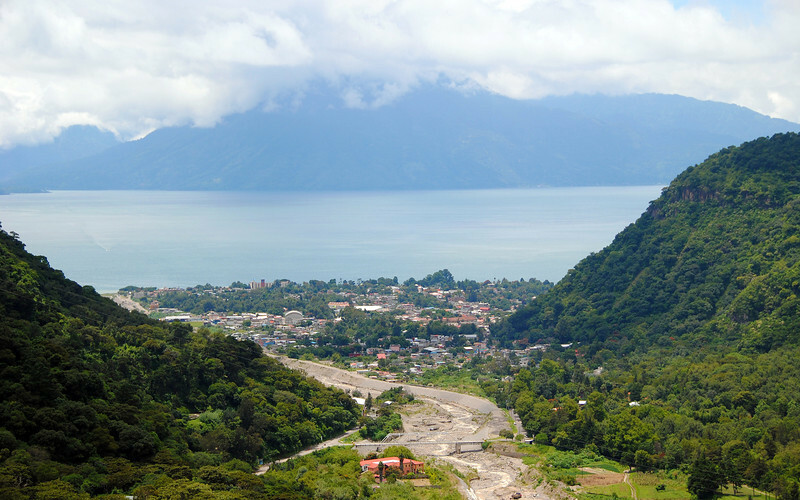 The streets are bare of tourists and the late morning sky already darkens with imminent rain clouds every day, obscuring the tops of the volcanoes surrounding Lake Atitlan. 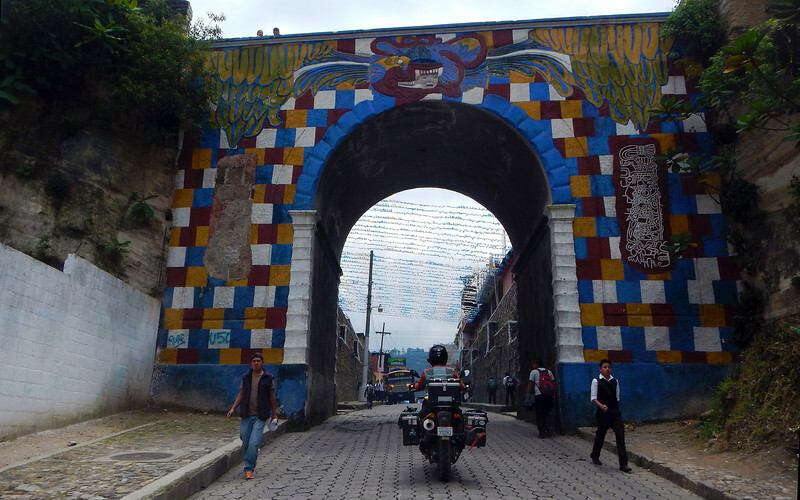 Part of the reason why we are staying a couple of days in Panajachel is because this was the last place we were before we had to abandon our leisurely pace to rush through Central America. 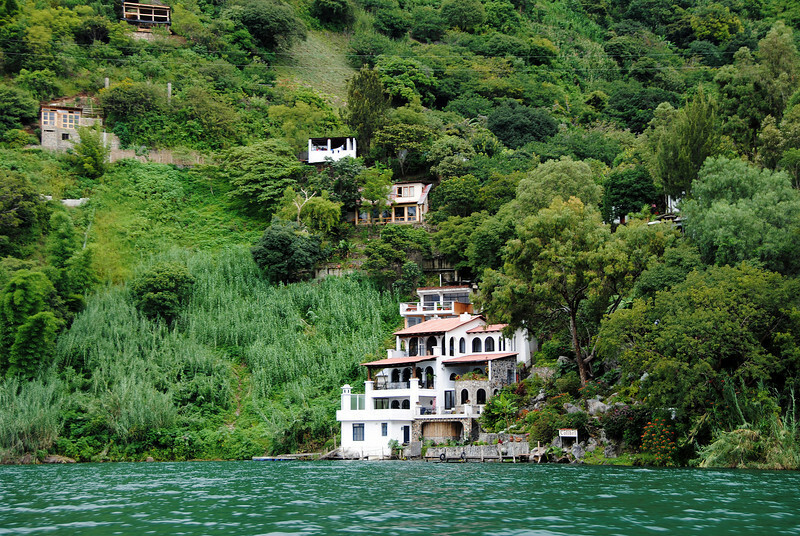 We missed out on all the little Mayan towns and villages dotting the shores of Lake Atitlan, some of which are only accessible by water because of the volcanoes surrounding the lake. 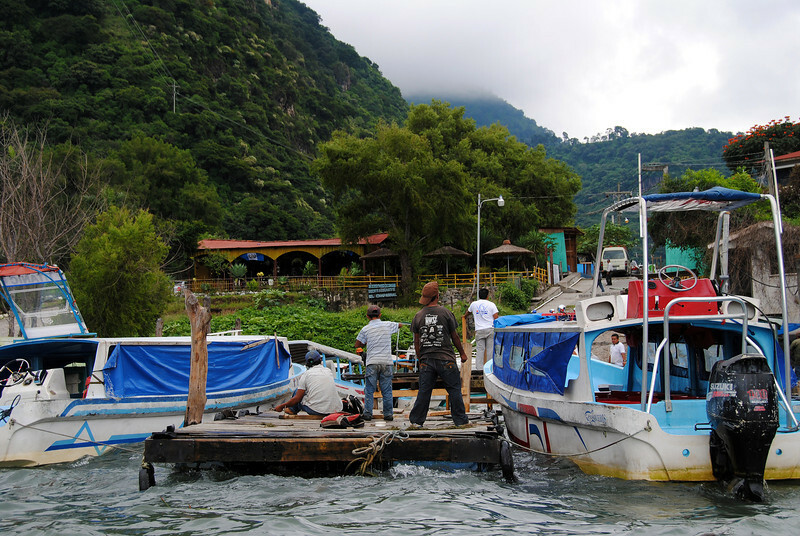 There is a public ferry that shuttles travelers from town to town on the lake, it only costs Q25 (about $3). 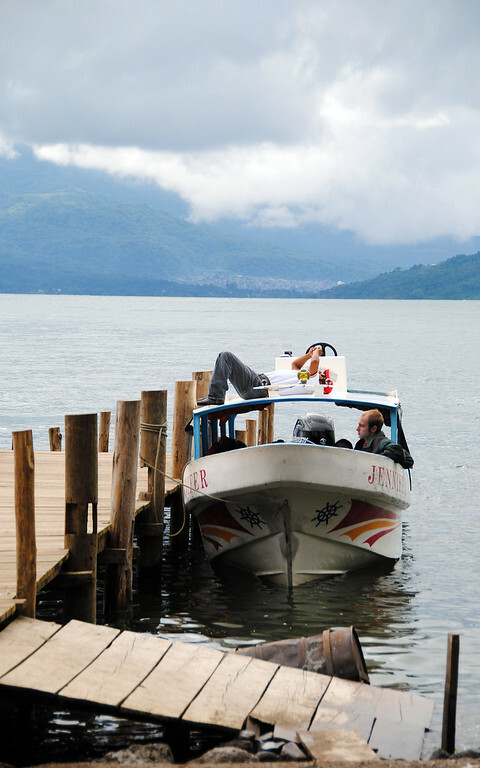 However, private boats offer faster, more direct service for a higher fee. We watched as they filled their seats with their sales pitches to impatient tourists. One well-dressed Frenchman dished out Q200 ($25). 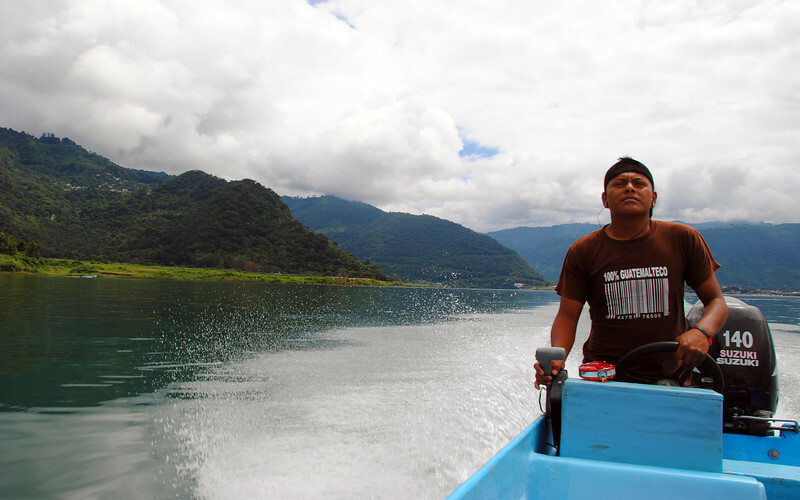 He sat in the boat and waited angrily as the captain kept lowering his price to fill all the seats on the boat. Other tourists bargained down to Q100 ($13). We waited till the very last minute before the public ferry was to arrive and scored seats for Q50 ($6) each! The French guy was livid! San Marcos is a very small Mayan village where yoga retreats and alternative medicine centres have inexplicably sprung up. It felt weird walking the narrow dirt paths between closely packed buildings offering gourmet health food and boutique hotels, squeezing past western women in Lululemon yoga gear, sweaty from a morning session of Downward Dirty Dogs and Cameltoe Poses. 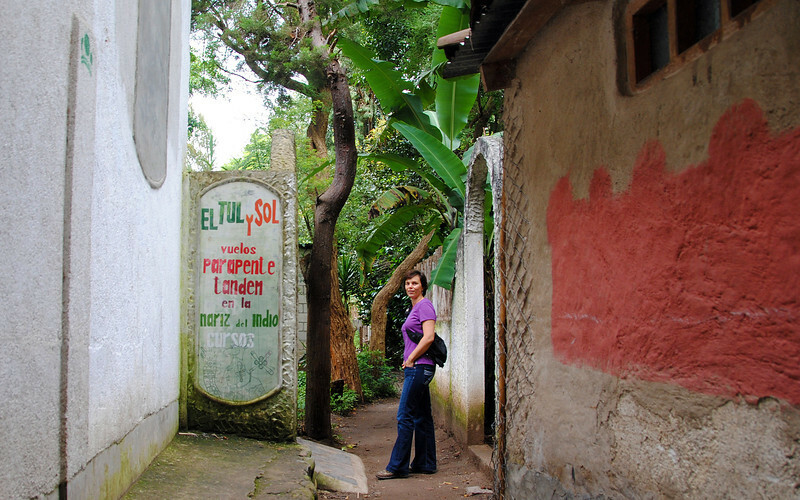 Outside the Fruity Yoga centre, we spent more time strolling through the real San Marcos. 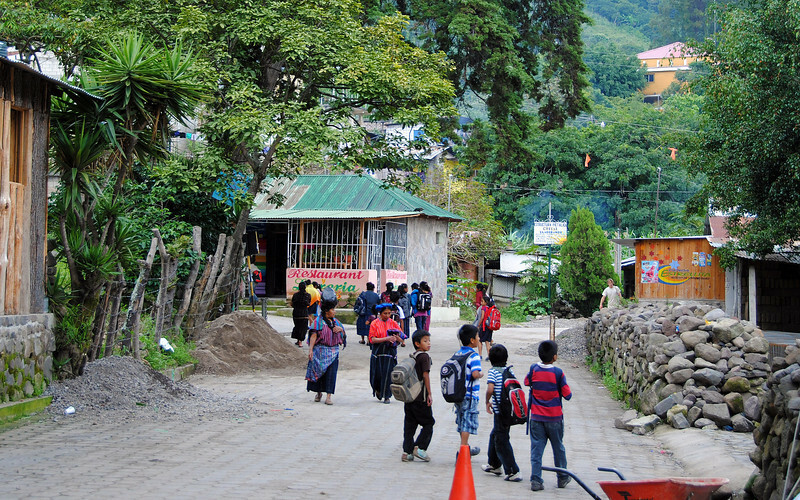 Children had just broke from school and were running and playing in the streets. 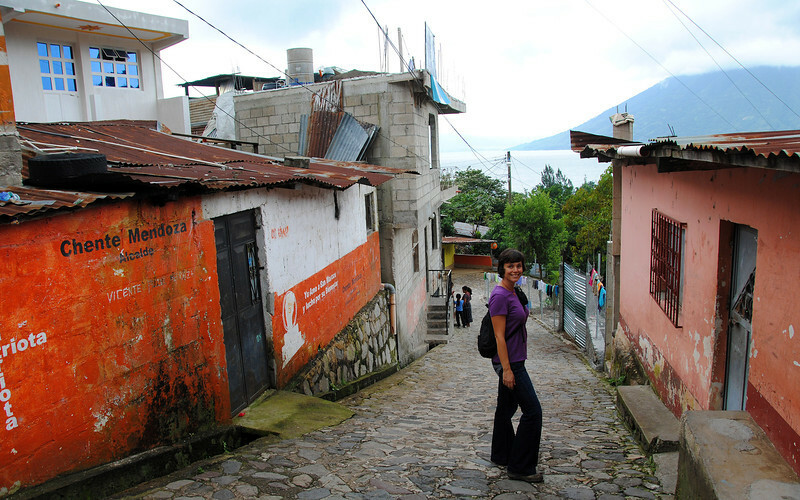 We got quite a workout walking up and down the very steep hills of the town, peeking into buildings to get a glimpse of what life is like here. We thought we did so well negotiating with the private boat. We found out that the actual public ferry didn't take much longer and it was exactly the same kind of boat, but this one had a roof. It docked at another site just outside of Panajachel and cost Q20, not Q25! This was what the locals took! Those private boats were making a killing! 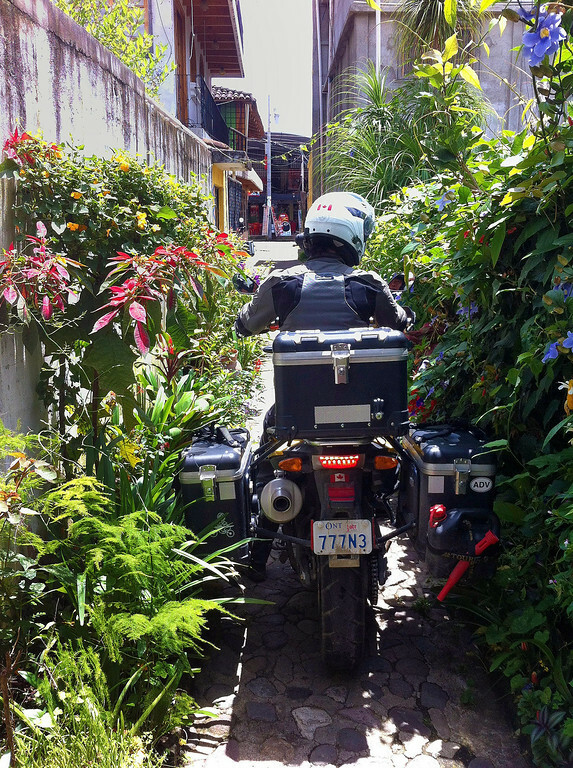 This was a great week-long road trip touring around the Guatemalan mountains, some entertaining dual-sport roads and lots of tight, twisty asphalt. 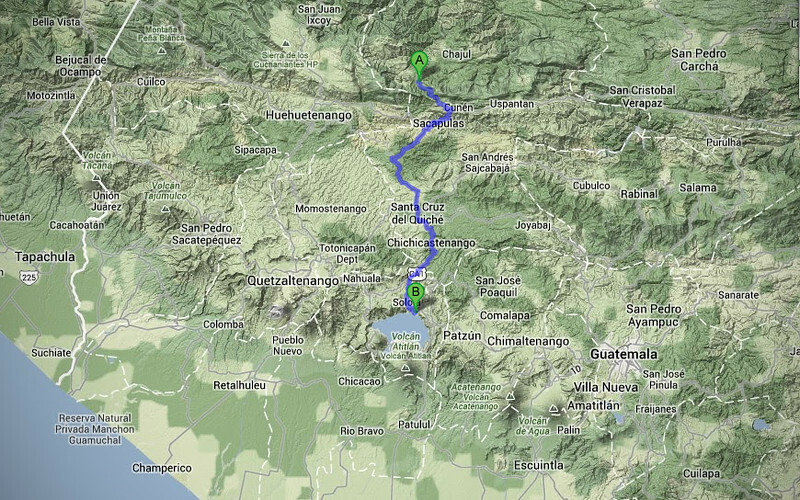 There are a couple of ways to get back to Antigua, the main PanAmerican highway, and shorter way that looked pretty good on the GPS - lots of switchbacks and more mountainous scenery. We asked a local on the way out which was better. He said the "shortcut" was less time, but was less "secure" (seguridad). This is what "less secure" means. 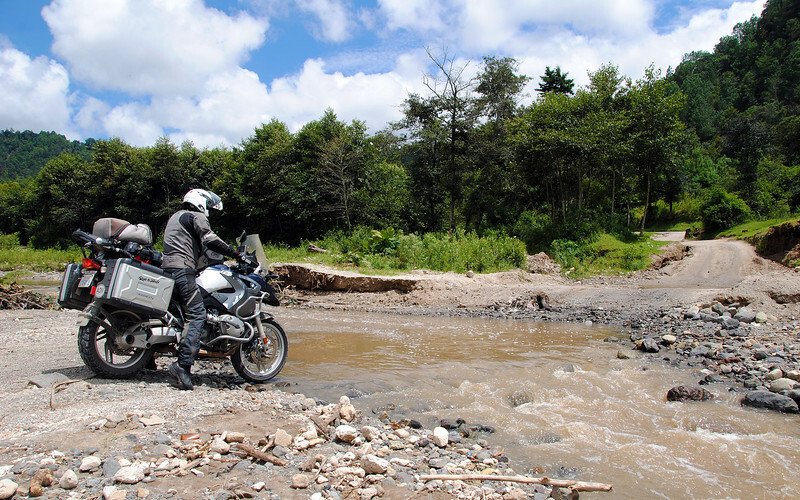 We rode though broken roads, some washed completely away. 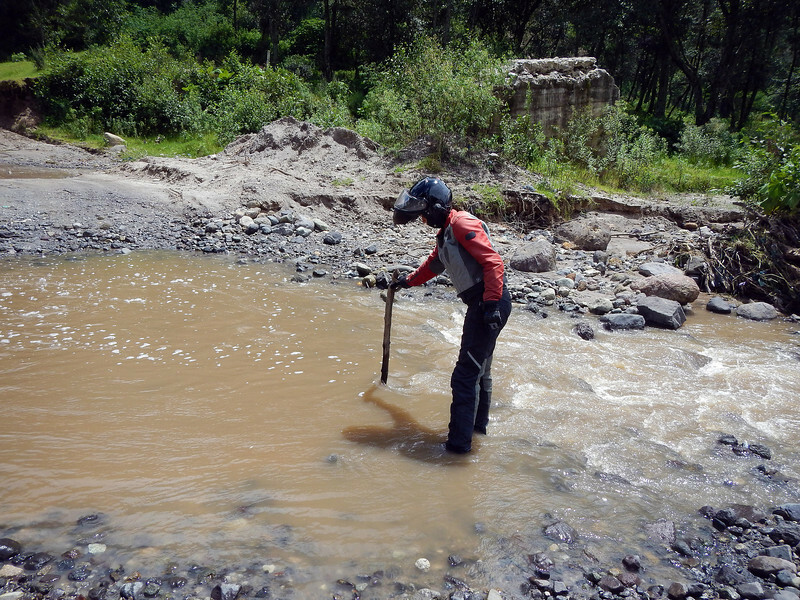 Neda is testing to see where the lowest point in the river was to cross.